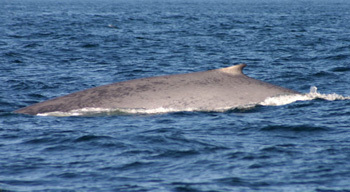 Unlike what its name indicates, the Blue whale is more silvery-grey than blue. It usually surfaces 6 to 20 times and then goes underwater for 5 to 15 minutes. The spout is hight (30 ft) and thin. The back fin, which is relatively small, is sometimes seen only at the last surfacings. Some Blue whales will show their tail when diving, but most won’t. The largest animal ever to exist on this planet and the only that can give birth to 2 ton “babies”. Frequency has varied over the past years. Some years Blue whales are very abundant and some years not. Perhaps related to the abundance of krill, their favored food, in our waters.